My name is Kimberley Grant and my passion is the West Highland White Terrier. Along with Quince and my sons Steven and Karter we raise westies on our acreage 1 hour north of Calgary Alberta Canada and 1/2 an hour west of Olds Alberta near the town of Sundre Alberta. We are also blessed with the occasional litter of Cairn Terriers. 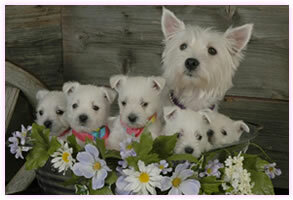 We take great pride and care in raising and breeding our westies. The love and affection they return to us and the loyal companionship they provide their future families is well worth the hard work. In addition to breeding westies and cairns we also provide both boarding and grooming services for the westies and cairns we sell. Our customers are primarily from Calgary and Edmonton but also include westie lovers from British Columbia, across Alberta, throughout Canada and into the United States of America. The West Highland White Terrier is a charming breed with an outgoing manner and a love for company and attention. They are highly intelligent, learn very quickly, and are devoted family members.